The Apple Airpods 2 are finally official. In a move that should surprise absolutely nobody, given how well the originals sold, Apple has a follow-up to the true wireless headphones that launched a thousand imitators. Other than the “new” button hovering over them on the Apple Store, you’d be hard-pushed to spot a difference on the surface. They’re the same familiar-looking white earbuds with a long stem that fit neatly into the charging case. The improvements are on the inside. The first improvement is that you can now chat to Siri through the earbuds with a simple “Hey Siri”. Much like headphones with Google Assistant, this means you can get information delivered straight to your ears. Second, the battery has been significantly improved. Apple reckons that you’ll get a whole extra 50% more talk times. That only equates to an hour, but presumably that means their stamina when listening to music will also be improved. Third, there’s the option of wireless charging. This isn’t the default, and the version with a wireless charging case will set you back £40 more. They’re available to order right now on the Apple website and will begin shipping next week. 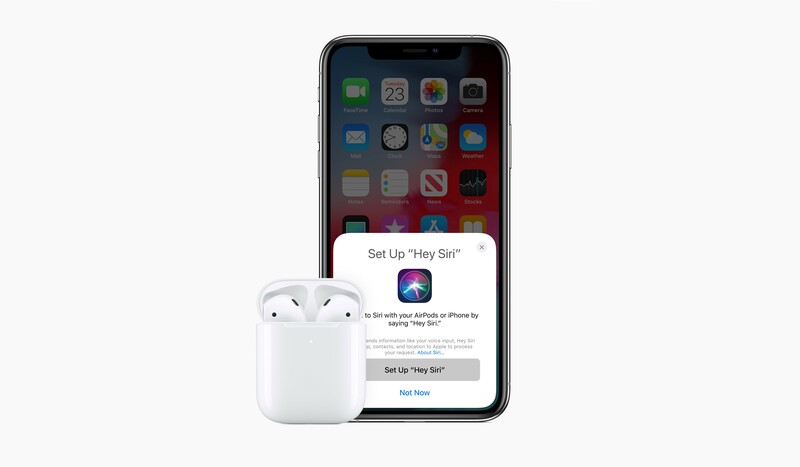 The regular AirPods cost £159 – the same as before – while the second-generation AirPods with wireless charging case come in at £199. If you just want to give your existing set of AirPods wireless charging, you can buy the standalone case for £79.